The higher spec HERO4 is available in two flavours, the HERO4 Black, which is priced at $499 and the HERO4 Silver which sells for $399. The pricier HERO4 Black captures cinema-quality 4K video at 30 frames per second (fps), 2.7K video at 50fps and 1080p video at a super-fast 120fps, with the ability to knock out 12MP photos at burst speeds of 30 photos per second. The silver version serves up the same top-notch image quality as the HERO4 Black, but isn’t quite as hot on video, with video capture modes including 4K30, 2.7K50 and 1080p120, plus “50% faster Wi-Fi” combined with Bluetooth. At the other end of the spectrum is the HERO, an entry level GoPro priced at $129, which captures high-quality 1080p video at 30fps and 720p video at 60fps, built into a rugged, waterproof housing. SAN MATEO, CALIF. (September 29, 2014) – GoPro, Inc. (NASDAQ:GPRO), enabler of some of today’s most immersive and engaging content, today unveiled HERO4, the highest performance line of capture devices the company has ever made. 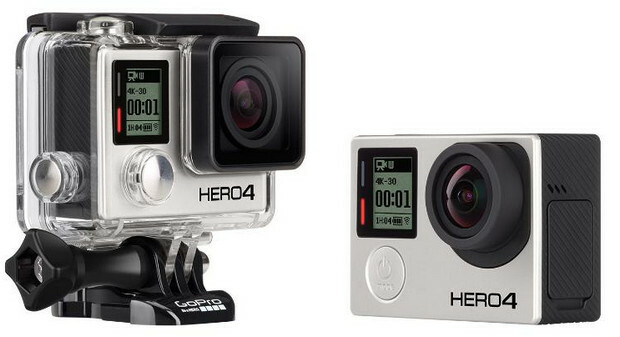 HERO4 is available in two editions, HERO4 Black at MSRP $499 and HERO4 Silver at MSRP $399. GoPro’s Emmy® Award-winning imaging technology combines with enhanced ease-of-use and powerful new features such as 4K30, 2.7K50 and 1080p120 video capture (Black) and built-in touch display convenience (Silver), to make it easier than ever for consumers to self capture and share stunning, professional quality content of their favorite experiences. HERO4 Black delivers 2x the performance of its best-selling predecessor and now captures cinema-quality 4K video at 30 frames per second (fps), 2.7K video at 50fps and 1080p video at a blistering 120fps, virtually eliminating rolling shutter in most scenarios while allowing for time-bending slow motion effects. HERO4 Black also features an entirely redesigned audio system that captures high fidelity sound with 2x the dynamic range of previous models. Additional enhancements include improved image quality, low light performance, highlight moment tagging and an improved user interface that allows for easier discoverability and access to key features and controls. The HERO4 Black is simply the highest performance GoPro yet. The most advanced GoPro cameras yet. HERO4 Black and Silver share powerful new features that expand what’s possible with a GoPro. 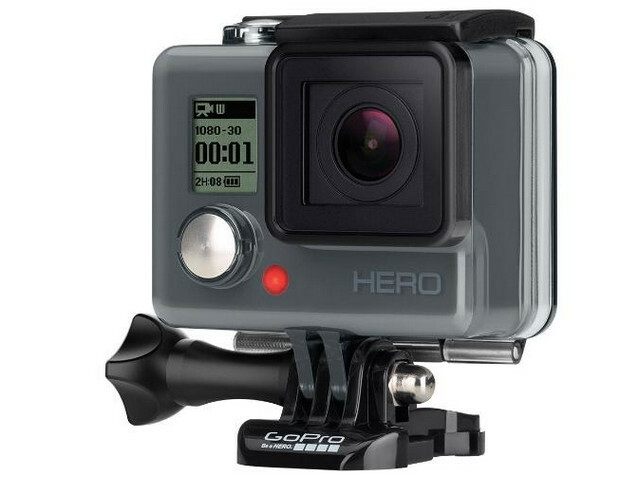 GoPro is also proud to debut HERO, the perfect entry-level GoPro. Designed with simplicity in mind and built directly into a rugged, waterproof housing, HERO captures high-quality 1080p video at 30fps and 720p video at 60fps. HERO captures the same immersive, eye-popping footage that’s made GoPro one of the best-selling cameras in the world—all in a simplified package that’s accessible to everyone with an MSRP of $129. For more information visit the HERO product page on GoPro.com. Smart Remote – Control your GoPro from up to 600’ (183m) away with the wearable and waterproof remote. Conveniently mark key moments as they happen with the Smart Remote’s HiLight Tag button when paired with a HERO4 Black or HERO4 Silver. The Handler – A compact floating handgrip. Lightweight, ergonomic and durable, The Handler is perfect for handheld shooting during any activity. New BacPac accessories – A new and improved Battery BacPac provides almost twice the battery power over the camera’s internal battery alone. And a new LCD BacPac provides improved touch and swipe performance when used with HERO4 Black. GoPro announced several updates to its popular GoPro Studio desktop editing software and mobile GoPro App. GoPro Studio makes it easy to import GoPro footage from your camera to your computer to create professional-quality videos. GoPro Studio features GoPro Edit Templates, template versions of some of GoPro’s most popular videos. All you have to do is replace the original GoPro video clips with your own favorite clips and the editing style that has made GoPro famous becomes your own. GoPro Studio now supports the HERO4’s HiLight Tag feature, making it easy for GoPro Studio to identify your videos’ best moments thereby allowing for faster and more convenient editing. Also new to GoPro Studio is Flux™, a powerful ultra slow motion and speed ramping tool that enables the dramatic time-shifting effects GoPro has become so well known for. Want to highlight a particularly awesome moment in one of your edits? Flux that thing and share it with the world. The GoPro App for mobile not only gives you instant access to the GoPro Channel and all of the incredible content that has made it the number one brand channel on YouTube, it also gives you full control of HERO4 Black and Silver and allows for quick and easy changes to any mode or setting. Expanded GoPro App support for HERO4 also includes support for HiLight Tagging while recording, as well as searching for tags during playback. As always, the GoPro App also allows for shot preview, playback and sharing of your favorite photos and videos via email, text, Facebook, Twitter and more. GoPro is committed to inventing innovative tools that make it easy for people to self-capture and share engaging and immersive experiences with others. Learn more about HERO4 line and the entire GoPro ecosystem of software and accessories at GoPro.com, or visit your local retailer today. *Than previous comparable HERO3+ models.